We love this city, and every day we find a way to renew this regard. In our wanderings through the streets of Florence, we meet scents, tastes and sights that remain in the heart. This is the list of our recommendations for students who arrive in Florence. Florence is the city of good food, it’s amazing to see how much variety has to offer the old town. Be very careful about addresses and street numbers: black are for houses and red for shops. So in this page you will find almost only red numbers (for instance 12r mean 12 red, and is not necessarily after the black 11). 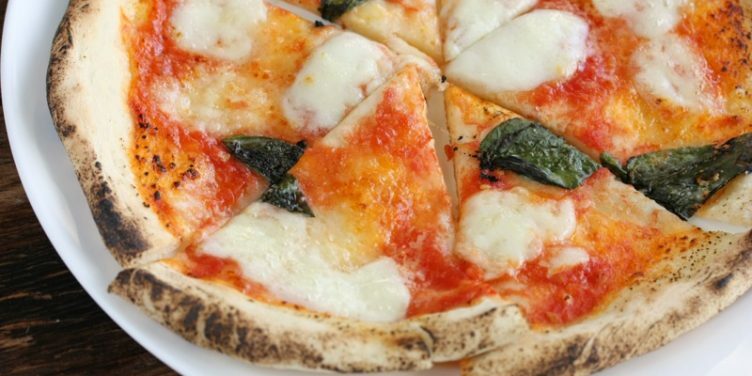 PIZZAMAN, Via dell’Agnolo – 105/107 r.
TRATTORIA SAN PIERINO – Via Sant’Egidio, 13/r. MARIO – Via Rosina, 2/r. Very good price, also for a glass of wine and a little try of traditional food. Maybe not the cheapest one, but for sure one of the best place where you can try the local steak (fiorentina). TOUCH – Via di Mezzo 42/r. Tuscan cuisine revisited in a contemporary way, one of the most particular restaurants in Florence. IL VEGETARIANO – Via delle Ruote, 30/r. For vegetarians and not, cosy restaurant with a homely atmosphere, set the table by yourself and enjoy fresh and organic recipes with a good quality local wine. TEATRO DEL SALE – Via dei Macci, 111/r. Enjoy a dinner and a concert in this magical place located in a former 14th-century convent in Santa Croce neighbourhood. On Sunday they also organize brunch. A bakery very close to our academy, they prepare very big and tasty sandwiches for only 4 euros, which is rare to find in the center of the city. 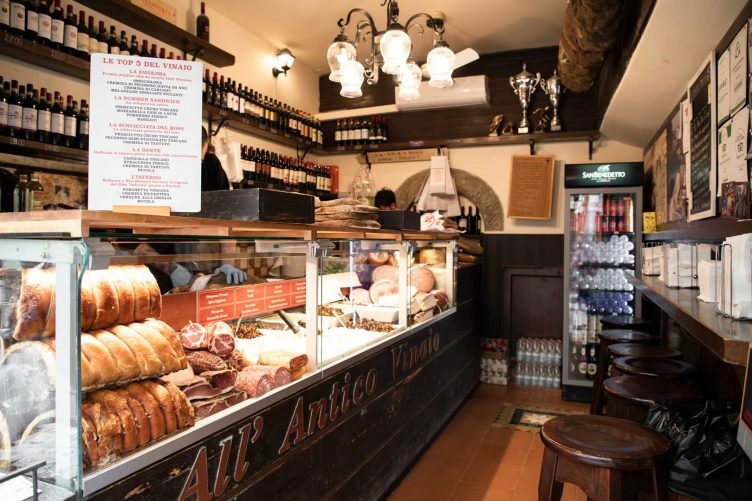 ALL’ANTICO VINAIO – Via dei Neri, 74/r. Vinaio or Vinaino means Winery. Is very common for florentine people to go out and meet in front of one of these shops to have a glass of wine and a piece of schiacciata. This one is the most famous. 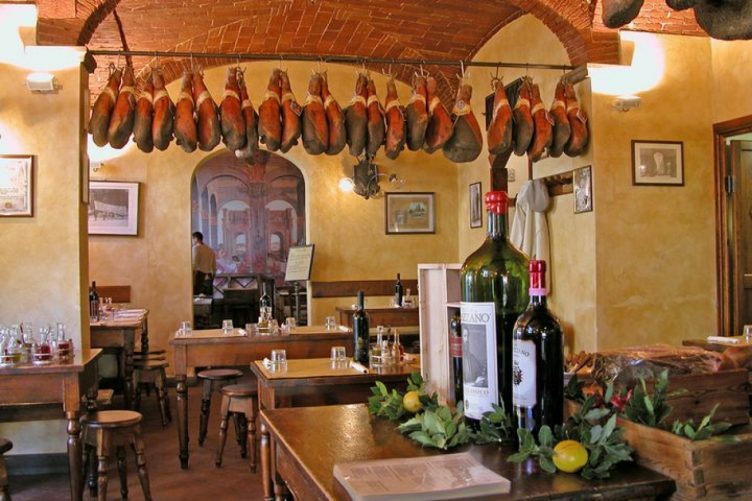 If you want a good alternative to “Antico vinaio”, you can find equally great places and maybe cheaper and quieter. For instance, the little cosy one in S. Frediano will not fail you. If you are into Italian culture, you should know how “Aperitivo” is a real tradition in Italy. These are some of the best places to have an “aperitivo” and “apericena” in Florence, normally from 6.30 pm to 9.30 pm. (“Apericena” literally means “aperidinner”, and it’s a cheap way to try different kind of local food. You pay more than one drink but you have a free all you can eat). NABUCCO – Via Ventisette Aprile, 28/r. SOUL KITCHEN – Via de’ Benci, 34/r. Very good bar, near the academy. QUELO BAR – Borgo Santa Croce, 15/r. FUK – Via Giuseppe Verdi, 19/r. 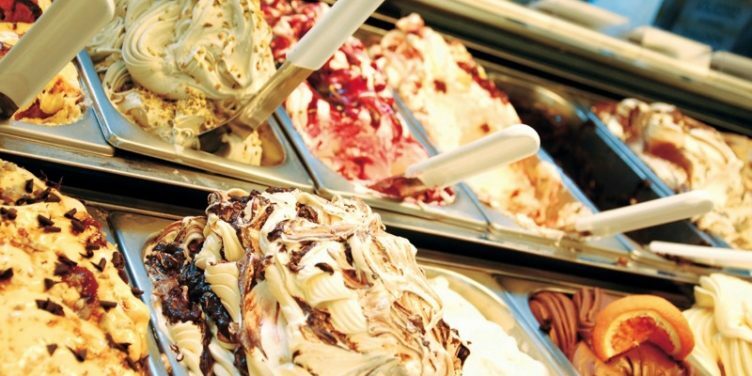 “Gelato” is another thing that characterizes daily life in Italy, and Florence is quite successful from this point of view: there are really a lot of high standards “gelaterie” in the city! LA CARRAIA – Piazza Nazario Sauro, 25/r. GELATERIA DEI NERI – Via dei Neri, 9 – 11/r. EDOARDO – Piazza del Duomo, 45/r. VESTRI – Borgo degli Albizi, 11/r. VIVOLI – Via dell’Isola delle Stinche, 7/r. PROCOPIO – Via Pietrapiana, 60/r. RIVARENO – Borgo degli Albizi, 46/r. The real florentine beef steak. Don’t ask for a well-cooked or a medium fiorentina, cause it’ll be at your own risk. It’s always rare. Vegetarian soup mainly made with the typical black cabbage, bread and beans. If you come to Florence you can’t miss to taste this florentine speciality. It is made from the fourth and final stomach of the cow, which is typically chopped, slow-cooked in a vegetable broth, seasoned with herbs, and served on a bread roll. It is often topped with a spicy sauce or a green sauce. want (cheese, meat, vegetables and sauces). Fried sweet round bread with sugar on it and filled normally with cream. Traditionally eaten fresh-baked for “merenda” (the meal that Italian people have around 4.30 p.m.). You can try this near the academy: via Matteo Palmieri, 30/r, 50122 Firenze FI. In this place you can also try COCCOLI, another type of fried bread, salted, that is commonly eaten with stracchino (soft creamy north-italian cheese) and prosciutto (ham). This is a very traditional dish in Firenze. It is made of beans (cannellini type) and tomato sauce, with local herbs and spices as seasoning. It is a local charcuterie (cold cut) made of the leftovers of the pig, especially the head. It is another type of cold cut, similar to salame (please don’t say “salami”, that’s plural, as “peperoni” or “panini”!!!) but with fennel flavour. Of course if you are having an aperitivo in Firenze you will try Spritz, even if this drink is from Venezia. But also Firenze has a traditional aperitivo drink: Negroni. You have to know although that this drink is really strong both as taste and alcohol content. The most famous shopping street in Florence, where to find many of the top designer fashion houses in the city. With Its beautiful historic buildings, your trip there is not complete without a visit to the Museo Salvatore Ferragamo. it is a popular street filled with high-end to everyday modern stores. You’ll find ultra luxury from Chanel to department store shopping at Coin. There’s also a Disney store for the kids. Furla, a famous Italian brand, is a prime choice for any of you purse lovers! Via del Corso has almost every product you can imagine. It’s lined with small boutiques that suit all different budgets so don’t be afraid to explore. Explore the authentic artisanal boutiques! Via Santo Spirito lies on the other side of the Arno River in one of our favorite neighborhoods in Florence: Oltrarno. This is the most important city market, where you can find the typical leather products and much more. Located about 15 minutes from the Duomo, it has an indoor space where you can find local cheeses and and vegetables, meat and fish. Outside you will also find some clothing, jewelry and ceramic stand, as well as other antiques. 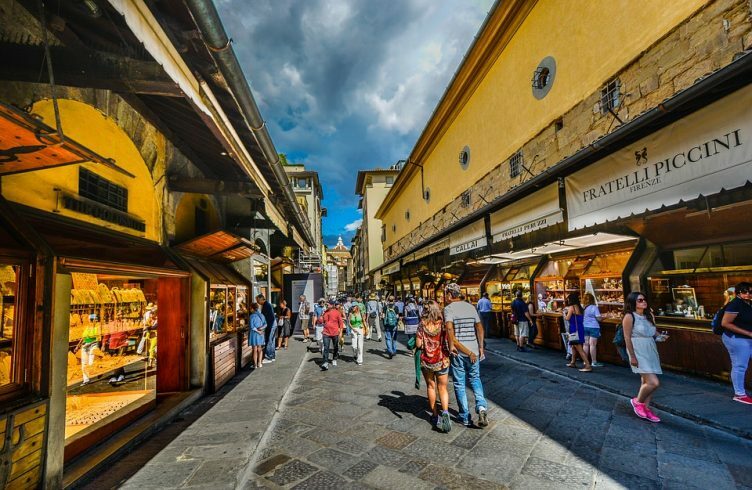 Located in the biggest greenery of Florence, every Tuesday you can buy everything you need in one place – they sell food, clothes, shoes and much more. This is a luxury Outlet is perfect for those who are fashion addicted. It is 30 minute far from Florence, but easily reachable with a direct bus service every 20 minutes. The main mall in Florentine area. It is not in the city center, you have to take Ataf bus N° 303 from Santa Maria Novella station. If you really want to go on a mission for shopping and buy cheap products from famous brands, you can go to this outlet, in the heart of Mugello. Here you can also have the possibility to visit the nice mountain area right outside Firenze and its known lake. Outlet Bus from Santa Maria Novella station. One of the most visited place in the Europe and the world; here you will find the Florence Cathedral with the Cupola del Brunelleschi, the Giotto’s Campanile, the Florence Baptistry, the Loggia del Bigallo, the Museo dell’Opera del Duomo, and the Arcivescovile and Canonici’s palace. Probably the most touristic square after Piazza del Duomo, it is the location of the cultural cafes an bourgeois palaces, such as the Giubbe Rosse cafe, which has long been a meeting place for famous artists and writers, especially those of Futurism. Decorated by several beautiful statues from the Renaissance era, this historical square is a must for everyone visiting Florence. Named after the Santa Croce Cathedral, it is a big, rectangular square in the center of the city. Here the Calcio Fiorentino is played every year. There are also some important buildings like and when can find on this square the Palazzo dell’Antella, the Palazzo Cocchi-Serristori (main office of center of Florence quarter) and the Dante’s statue. It offers the great Basilica of San Lorenzo with the Cappelle Medicee, a lively open market and the Laurentian Library. It is one of the principal squares of Florence with the Basilica of Santa Maria Novella. It is opposite of piazza della Stazione, and accessible by the Via degli Avelli. Close to San Marco museum, you find this quiet spot where students come and sit on the stairs to relax. There’s not much to do here, so don’t expect open-air tables or shops, but there’s a small and cosy café named UnCaffe – Da i’ Sardo which is perfect if you want to take something to drink and eat. This square is dominated by the pastel colour facade of the church of the same name. Students and artists hang around here. And every day there’s a morning market (8am-2pm). 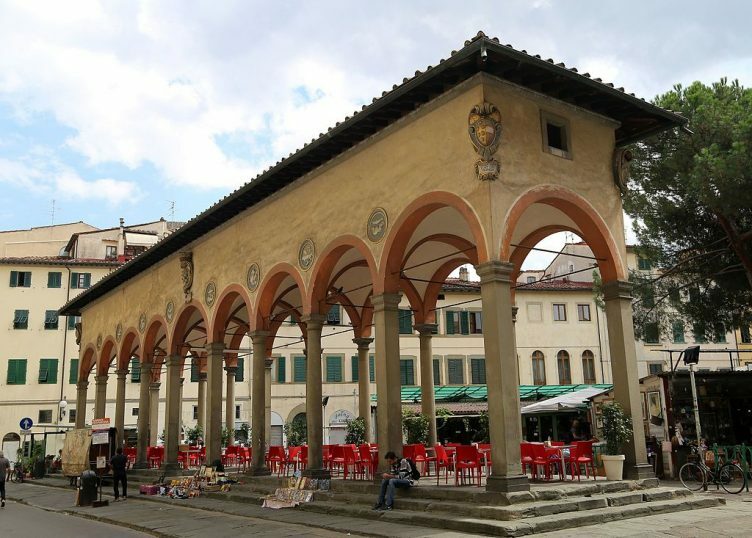 Very close to Europass School, in this small square you’ll find the “Loggia del Pesce” made by Giorgio Vasari. 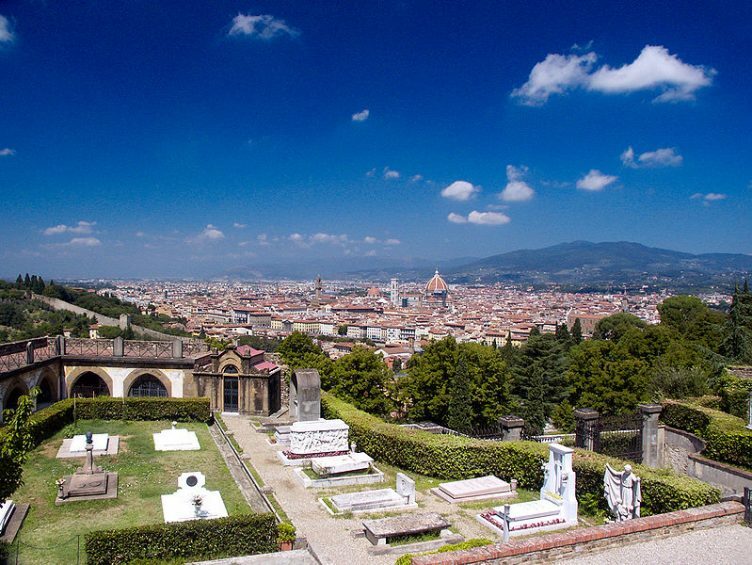 If you go there, try also to go and visit the church of San Miniato al Monte, one of the best. Form this medieval fortress you will admire the beautiful landscape, as well as taking part to contemporary art exhibitions that regularly take place in the garden. The original settlement of Etruscans, the civilization present on the tuscan territory preceding the Romans’ arrival. Form here the view on Florence is unique, a garden situated on a hill and surrounded by medieval walls. Watch the sunset form this romantic garden in the Oltrarno quarter, just under the Piazzale Michelangelo. A Medicean garden in the heart of the city, with lot of beautiful trees, plants and fountains, where to relax on the grass or just watch the beautiful Florence view. A quiet spot where you can chill out while admiring Florence skyline. Featuring a huge nineteenth century greenhouse, it hosts flower markets, and during summer it becomes an outdoor pub, with a kiosk, and concerts every night. The Parco delle Cascine (Cascine Park) is a monumental and historical park in the city of Florence, and the biggest green area of the city. Besides the monuments the Cascine Park also offers some big fields where you can relax. It’ a botanical Garden of the 14th Century is part of the University of Natural History of Florence. It displays a remarkable collection of medicinal plants. In this popular cocktail bar, a few minute walk from the Dome, you can experience the real Florence nightlife rituals tasting the extravagant shots prepared by Eby himself, the funny owner. VOLUME – Piazza Santo Spirito, 5/r. Classic cocktails with in-house variations. Look out for live music and DJ sessions at weekends. MAD SOULS & SPIRITS – Borgo S. Frediano, 36-38/r. Creative cocktails with weird names such as Losco Mule (vodka and ginger beer), Donald is a Trump (bourbon and carrot jam) and Swedish Mealballs (aquavit, orgeat, fresh herbs and ‘love’). Open from warm summer evenings, you can drink classic mojitos or a Santa Rosa punch, the house special (black tea, vermouth and whiskey) enjoying the laid-back jazzy, Latin or bluesy tunes. Some stay for dinner where fish and seafood is a speciality. Hidden in an alley in the city center, Florence Jazz Club is a small and cosy music pub where locals spend the cold winter nights, listening to the best jazz, blues and rock ‘n’ roll florentine underground bands. This underground venue in Florence is always on the move, as often organizes concerts and live music events, it is one of the florentines favourite. A place in the very center of the city (behind Piazza della Signoria) which continuously offers dance music nights. It is very popular between Erasmus students, so the atmosphere is really “international”. Warehouse-style Tenax is Florence’s most edgy nightclub. With a superb sound system and varied selections of quality music, it is a great night out. 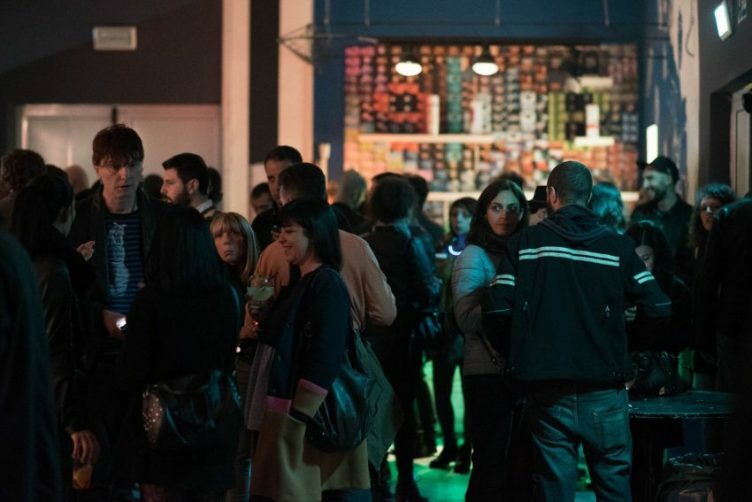 It is an alternative concept space, managed by an association professional volunteers, which offers on the weekends very cool live music, also with international artists. You have to be a member of the association to enjoy the shows, so you have to get a card that is valid throughout a year. Tender is a club where you can enjoy live music and DJ set nights. It is in the very center of the city, near to Santa Maria Novella station. The oldest science museum of the world, it’s particularly interesting visiting the section dedicate to the anatomy, with a huge ancient wax anatomical collection. 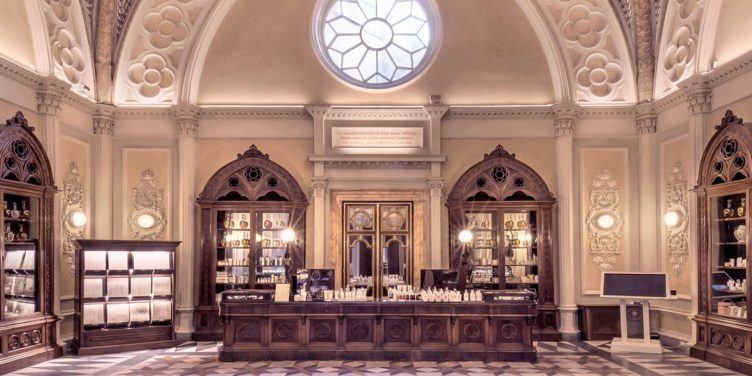 It is the oldest Pharmacy in the world, where perfumes, lotions and remedies are still made to ancient recipes. It’s worth to visit it only for its indoor spaces that are something unique, old and precious at the same time. Pietre dure (“hard stones”) is the art of using the natural variegation in semi-precious stones to assemble an image. The museum displays historic examples of pietre dure, which includes exquisite examples of finished objects—largely tabletops and cabinet plaques, but also an absolutely massive malachite fireplace. There is a room on the second floor of Palazzo Vecchio, which shows 54 maps decorate cabinet fronts, alongside 237 portraits of luminaries of the Renaissance. Entering this villa-museum is a breathtaking experience and pure ecstasy for lovers of medieval warfare. The museum contains dozens of perfectly preserved sets of plate armor framed by a series of beautiful Botticelli, Crivelli, and Pieter Brueghel paintings, which themselves were chosen not for the subjects themselves but for the clothes they were wearing. 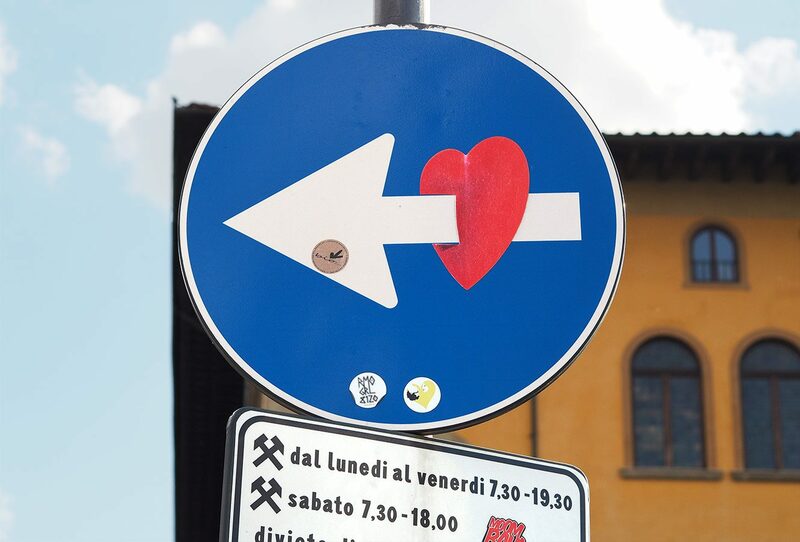 Finally meet the author of the marvelous artistic street signs you can spot around Florence. Clet’s funky style shows that Florentine art doesn’t have to be old and stuffy to stay relevant and revered. The studio is situated on a corner of the San Niccolò neighborhood and is a fun place to glimpse a contemporary artist at work. There are lot of organized tours for a walk from Settignano to Fiesole. This wonderful itinerary will give you a snapshot of the richness and beauty of the countryside surrounding Florence. Immerse yourself in the landscapes that inspired Leonardo da Vinci! You should organize a walk through Le Balze, one of the most beautiful and fascinating areas of Tuscany. Retrace Leonardo’s steps and discover the sceneries depicted in the Mona Lisa. If you like driving, you should rent a car for a day and visit this magical 11th century abbey immerse the Tuscan hills, just 1.30 hours from Florence. Two important historical towns in Tuscany and not-to-be-missed sights for anyone visiting the region! Close together, yet very different in personality. Perhaps the most romantic city in the world, made up of 118 islands and connected by 350 bridges! 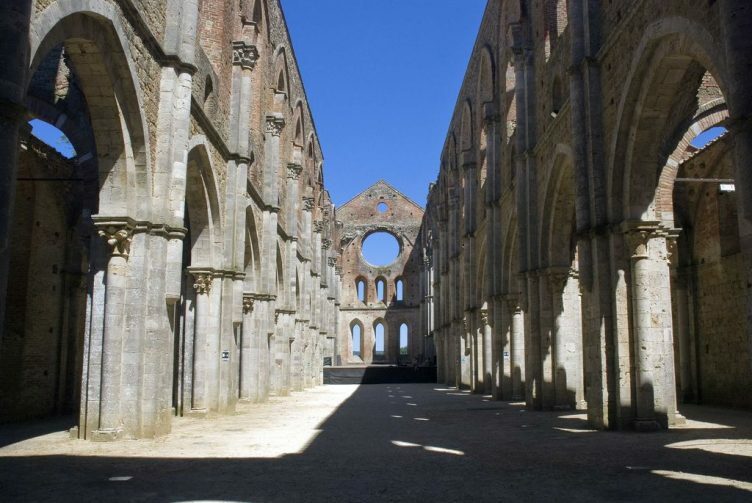 Magnificent examples of Medieval art and architecture in the heart of beautiful Tuscany, and both are UNESCO world heritage sites. Some of the most beautiful countryside in Tuscany, with cypress trees, hay bales, rolling hills and vines: It’s no surprise that the directors of New Moon, Gladiator and Under the Tuscan Sun chose Montepulciano as one of their key filming locations. A postcard-worthy backdrop as you hike through the hills of the region of Liguria. Five towns perched on the rocks, joined by spectacular trails, through vineyards and steep terraces. The beautiful Piazza dei Miracoli and its Leaning Tower is one of the most famous piazzas in the world, and a UNESCO World Heritage Site since 1987. Pisa is a city of art and culture, also famous for its past from the Maritime Republic. The picturesque Tuscan countryside, with olive groves and vineyards, and a visit to a charming wine estate, the magnificent fortress of Monteriggioni and the town of Castellina in Chianti. The opportunity to quickly discover the traditional Italian culinary universe. A simple dinner to prepare together, in a warm environment, where it’s easy to make friends. Do you have questions about our courses and services? We are here for you.